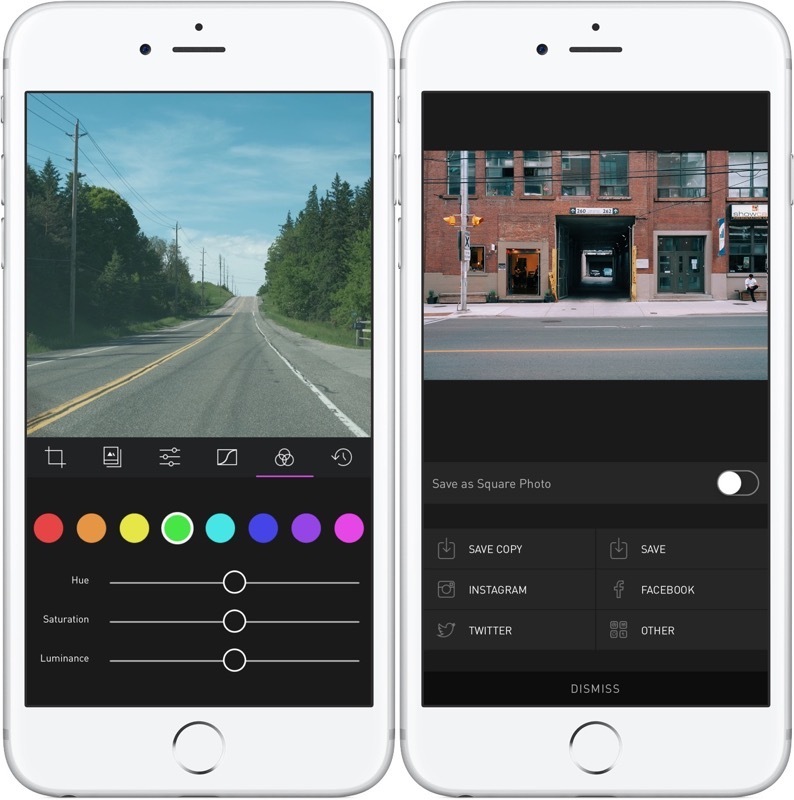 Darkroom is a photo editing app that deserves a lot more attention than it currently gets. The photo editing market is already quite crowded, and there are a ton of apps out there that can a decent shot and make it a great one in a couple of taps. You know the drill: you load an app up, tap it to open a photo from a camera roll or album, edit, and then save that photo. Rinse and repeat. The vast majority of photo apps havenâ€™t spent a lot of time thinking about how else users might browse and edit photos. The developers of Darkroom obviously have, and this is one of its killer features. I love that Darkroom actually displays my iOS photo library, very similarly to how I would see it in the default Photos app. Thereâ€™s no need to navigate a menu and edit photos one by one because I can just swipe between full-screen images, or see all my images as tappable thumbnails. I love that I can also â€œFavoriteâ€ and delete apps, with buttons along the top of the screen. This makes Darkroom an app that you can spend a lot of time in. You can use it to browse your recent shots or albums, or you can actually get down to work and make edits. The wonderful thing is that the two experiences are melded seamlessly, which is something that neither the iOS Photos app, nor the legions of third-party editing apps really get. If youâ€™re new to photo editing, Darkroom has a really fantastic set of default filters that come with the app. A100 and A110 are designed so well that theyâ€™ll give 90% of your shots a great punch of colour and mood. But if youâ€™d like to get more involved in the editing process, Darkroom has lots of tools for this as well. There are the usual sliders for exposure, contrast, saturation, and more. Youâ€™ll find these in most every app, though, so thatâ€™s not a surprise. But there is also a great tone curve (available via in-app purchase) for tweaking highlights and shadows, as well as tools for tweaking the hue, saturation, and luminance of colours in your image. If you want that red car in your image to really pop, Darkroom can help you do that with just a few taps. Another interesting feature is that the filters you apply in Darkroom use these same manual controls presented to you in the UI. So if you apply A100, youâ€™ll actually see that the Sharpness slider is set to about 25%, that yellows are turned down, and that greens are given a very different hue. This is a great way to learn how to achieve different looks in photo editing, and itâ€™s also a great way to start tweaking things until you have your own look. Because not only does Darkroom have its own set of filters (and extra ones as in-app purchases), but it also allows you to build off of these looks and create your own filters (just like you can do in Adobe Lightroom on the desktop). This is another killer feature, and a big reason to really take the time to learn Darkroomâ€™s controls. When it comes time to save an image, you can create a new copy, modify the original version in your photo library, share to Twitter/Facebook/Instagram, or use the share sheet to send your photo to another app. There are really just two limitations to Darkroom that keep me from using this app full-time. The first is that the output resolution is limited to 12 Megapixels. This is fine for iPhone 6S Plus shots because that matches the camera resolution exactly, but itâ€™s a big reduction in detail for my 24 Megapixel shots on the Fuji and Sony cameras I own. Darkroom is good enough that it coul be my full-time editing suite (for the way I like to work with photos), but saving my files at half resolution is a real buzzkill. Being able to save files at their original resolution would be a huge upgrade for me. Darkroom is also sadly iPhone-only. This isnâ€™t a an app limitation, butÂ I doÂ I think this app would sing on the iPad Pro, even as a completely separate purchase. I havenâ€™t heard anything about an iPad-specific version in the works, but it has been good to hear that Darkroom is still in active development. The lack of full-res output in Darkroom can be a bummer, but the wonderful experience of using this app, and the incredible images I can create with it, far outweigh that single complaint. Iâ€™d still love a fix for that one issue down the line, but thereâ€™s no question that Darkroom is already one of the very best iOS photo editors out there. Darkroom is free to download, but I think youâ€™ll like it so much that youâ€™ll end up buying the Tone Curves and a few filter packs, too.